On the first day of Spring Festival of 2017, I joined a student-organized trip to Nuanquan, an old village in the neighboring Hebei Province. I thought it was a perfect jaunt, given that I had been wanting to see how locals celebrate this important holiday. The trip was a cheap RMB 320 that afforded me a one-night stay in a decent local hotel, travel insurance, and a ticket to a traditional performance called dashuhua. Our tour was organized by a local student group. There were about 30 adults, mostly foreign exchange students or scholars studying Chinese. On the bus, I heard some of them were excited to see the village; others asked their partners to take “Instagrammable” photos and Moments-worthy videos. A good four-hour drive took us to Nuanquan and when we began to alight around noontime, the excitement turned into disappointment. “This place is horrible,” I heard one woman telling her companion, her boyfriend I suppose. The parking lot, overlooking the plain countryside, was simply full of trash. Our student guide tried to appease the dismayed couple, but even she couldn’t explain why the place was dirty. A few walks toward the town center and more rubbish welcomed us. There were no decent toilets in the area as well. Even the “great” restaurants our guide recommended would pale in comparison to the local dining places in a regular Beijing hutong. In short, the town was short of luxury many of my fellow travelers were accustomed to in their Beijing bubble. Their frustration soon turned into frequent swearing. Yes, the town might be unattractive, and the guide might have failed to properly organize the tour, but I always believe that tourists should be prepared for the worst. In this case, their vanity and capriciousness made me livid that I wanted to respond to the group chat. But I realized they were just a nuisance and they shouldn’t affect my travel experience. Until the evening before the dashuhua performance, all I could hear were complaints from the foreign students. I guess it was only me and a few others who enjoyed the rawness of the countryside. Nuanquan showed me the rural, third-world China that not many bother to see. After all, the town has yet to experience the modernization happening in major cities in the country. Until that, we need to settle for open toilets and outdoor diners. 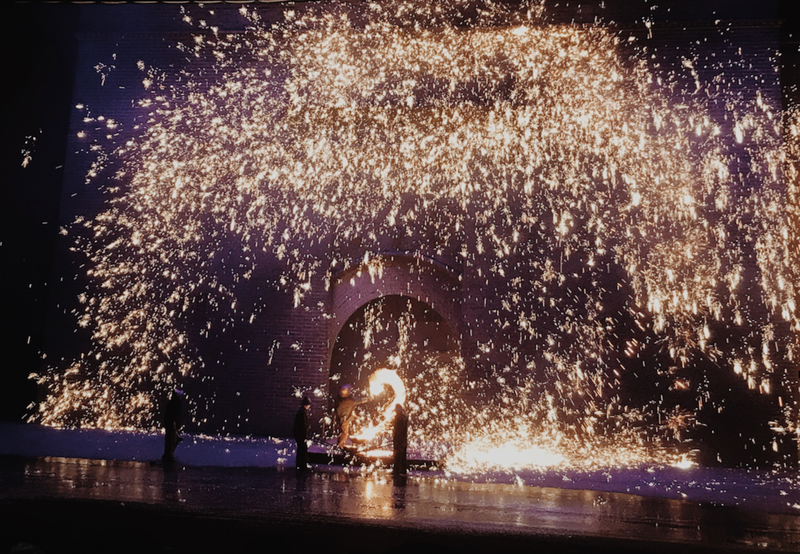 At the town theater, our tour group had a vantage point to see dashuhua, in which leather-clad performers sprinkle molten iron to mimic a fireworks display. People in ancient times melted cheap iron because they couldn’t afford gunpowder to celebrate the Spring Festival and to ward off evil spirits. I thought the show was spectacular. But what wowed me the most was most of my fellow travelers looked amazed and happy. No complaints at all. Maybe they were dazzled by the shining display? Maybe the show made them realize that there’s still something amazing left in otherwise a village not suitable for social media posting? Somebody should complain!